The CES language school on the high street of the attractive Oxfordshire village of Wheatley describes itself as a “boutique”. In education, the word suggests a friendly, intimate atmosphere, with small classes and a homestay nearby. This is exactly what MSMT founder Keith Killby and trustee Caroline Gavin were looking for in the early 1990s – and what the school continues to provide, to the great satisfaction of the Trust and the students we have sent there. It contrasts with the other college we use, Central School of English in London, with which we have also had a long and successful relationship. Two-thirds of our students opt for London. 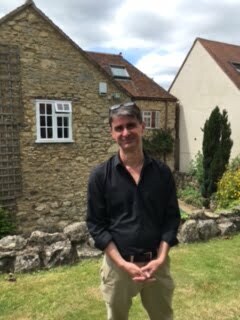 Peter Williams, Principal of CES-Oxford. The quiet setting of Wheatley, even though only five miles from Oxford, might appear an odd location. Since 2012 it has been owned by the CES group, which has seven schools and its nerve centre in Dublin. CES acquired it from Robin and Chris Vernede who founded the school in 1983, buying the derelict Oxford House Stores. The building is on the site of a Tudor inn that had once been owned by John Milton and burned down in the 18th century. It was rebuilt in the Regency period, with white plaster covering the limestone façade. It is an ethos that the current Principal of CES-Oxford, Peter Williams, has fully bought into. “It is a hard-selling marketplace but a type of student is drawn to that very English environment,” he says. In the summer of 2017 the Trust sent 10 students to CES on their month-long bursaries. Those arriving in high summer find the school at its busiest, with about 100 students from all over the world at Wheatley and another 100 junior learners (aged 12 to 16) at a residential campus in Ruskin College. Another “bulge” occurs in March/April, while at other times there may be as few as 20 students. The school has three office staff and four teachers – rising to 20 during the “bulges”. “This industry reflects tourism rather than education,” says Peter. “The challenge is how to deal with growth and contraction.” A long-term student will have any issues dealt with in the first week and then be settled; in summer, with short-term students, there are always issues to address. The school has 11 classrooms, with an average of six students per class. Morning lessons begin at 9.30, with an emphasis on grammar. Afternoon lessons take place on Tuesdays, Wednesdays and Thursday, concentrating on reading and writing skills and pointing students towards relevant exams, such as IELTS, FCE and CAE. The school arranges a busy social programme, including an orientation tour of Oxford every Monday afternoon. For example, for £5, go punting! The school also uses UK Study Tours for more distant trips. The school has an attractive garden and a kitchen that students often use to throw a party. “The Italians are particularly good at this,” says Peter.